I made these cookies for Christmas. I found them in the Every Day Food Christmas edition. I had planned to post in December about them, then realized I hadn’t. Sorry. These cookies are a little crisper than I like, but it didn’t take away from the greatness of this cookie. Meeshie loved them. So did I, and I’m not generally a fan of chocolate and peppermint. It always makes me think of York Peppermint Patties and I’ve never liked them. 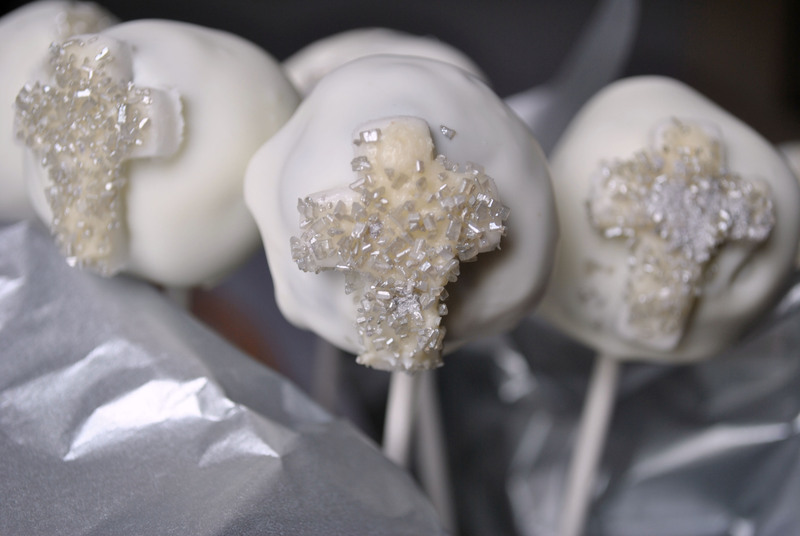 Don’t let the candy garnish prevent you from making these year round. You could easily substitute the Starlite Candies with buttermints at Easter. Or use green Starlite Candies in March. Or better yet, use white peppermint candy and a few drops of food coloring. These cookies, as is, are perfect for your favorite valentine. Use a heart-shaped stencil to sprinkle for the candy sprinkles. And use your own judgement on how finely you want to crush the candy. I made the pieces larger for Christmas, but making a candy dust for Valentine’s Day would be perfect, too. Combine first three ingredients in a medium bowl. Set aside. In a large bowl, cream the butter and sugar until light and fluffy. Scrape down the sides of the bowl and add the peppermint extract. Beat again for three minutes. Beat in egg. Slowly add flour mixture. Stir in chocolate chips. Roll the dough into quarter sized balls. Place on a parchment-lined baking sheet. Bake for 12 minutes in a 350 degree oven. Let cool for five minutes before transferring off the cookie sheet. Stir the confectioner’s sugar and enough cream to make a spreadable glaze. Spread a thin layer of glaze on top of each cookie (or dip the top of the cookies in the glaze) and sprinkle with the crushed candy. 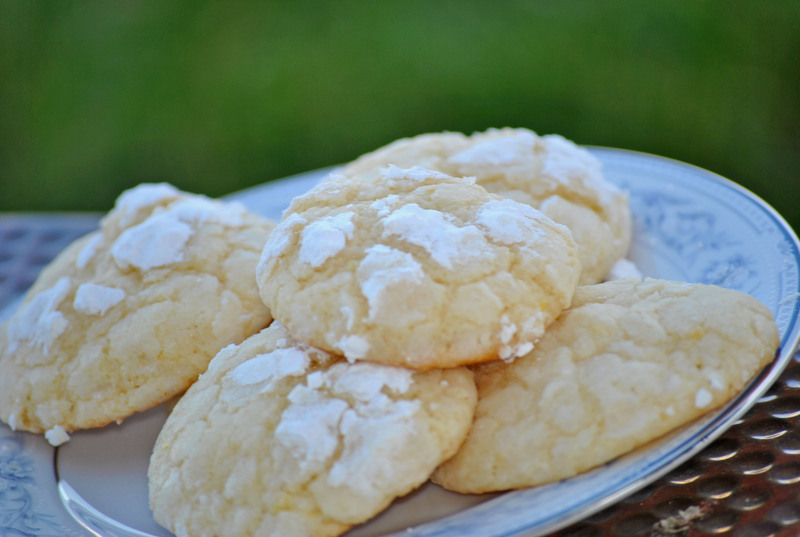 I know it’s fall and pumpkin season, but I needed to share this simple lemon cookie. I found this recipe a few months ago and kept forgetting to make it. I made it over the weekend while Meeshie was out spending the day with her friends. This one is being added to my Christmas cookie rotation, it’s that good. 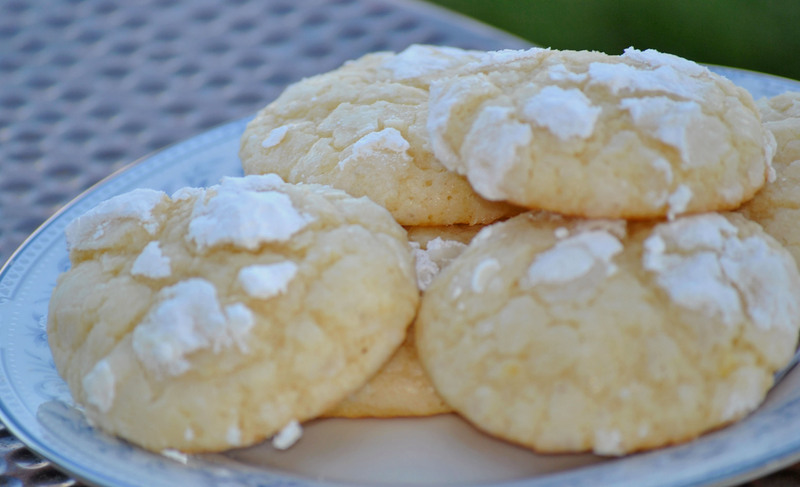 This cookie has a great outer layer of crunch brought about from rolling the dough in powdered sugar. When I sampled the raw dough (I know I shouldn’t with the raw egg, but I’m old enough to remember that was the best part of helping bake), it tasted like lemonade. The inside of the cookie is light and soft a perfect contrast to the crunch, and because the powdered sugar is baked into the cookie, there is less mess. A perfect grown-up cookie. In a large bowl, cream butter and granulated sugar together until light and fluffy. Whip in vanilla, egg, lemon zest and lemon juice. Scrape sides and mix again. Stir in the flour, salt, baking powder and baking soda. Scrape the sides of the bowl and mix again briefly. Pour the powdered sugar into a bowl or plate. Roll a golf ball sized amount of dough into a ball and roll in the powdered sugar. Place about an inch apart on a parchment lined baking sheet. Bake for 9-11 minutes or until the bottoms just begin to brown and the cookies no longer appear shiny. Remove from the oven and cool cookies for 3 minutes before transferring to a cooling rack. 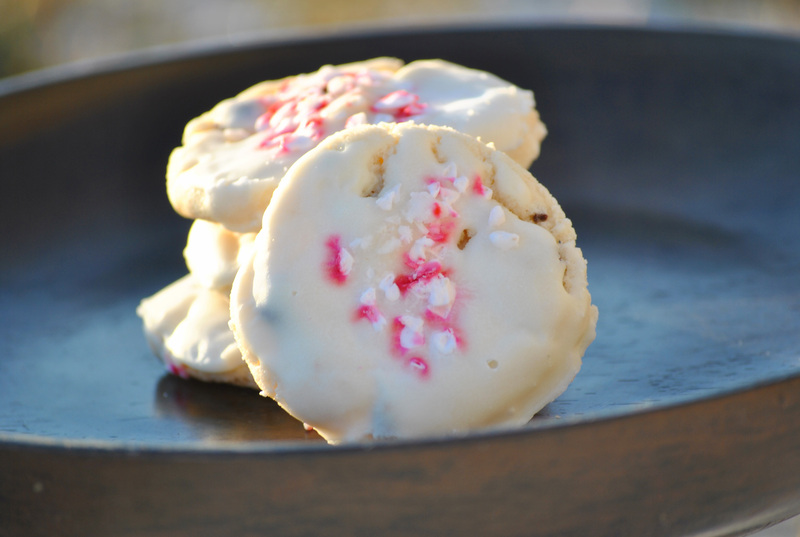 Speaking of Christmas cookies, am I the only one that tries to add at least one new recipe a year to share? Meeshie had her Girl Scout Halloween party today. I’ve been working on the costume and finished it over the weekend. She was a demented or evil fairy. I made a black tutu and spray painted some pink wings black. On the big day, she’ll also have glitter sprayed in her hair and on her body along with some mascara. Girls! I’ve taken a few pictures of the skirt, but haven’t had a chance to take care of the wings yet. I’m hoping to get the whole thing together this weekend and share. 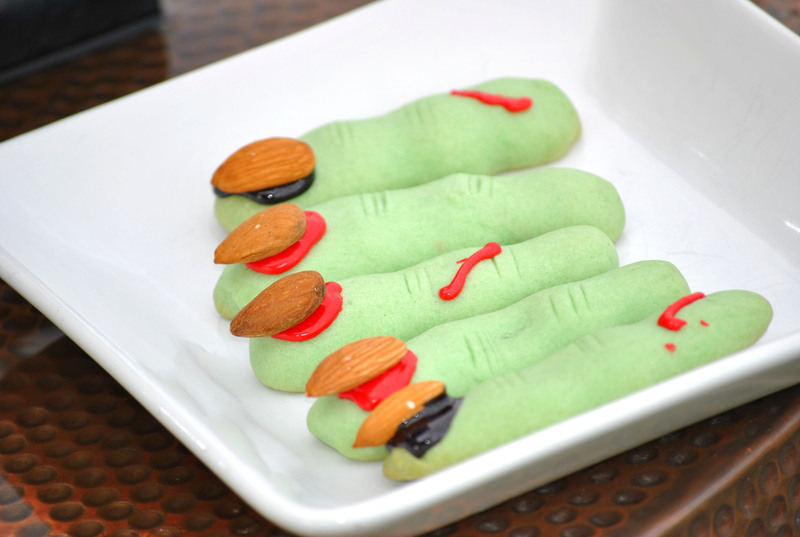 I did make these great cookies for the party, though. My friend Carol gave me the recipe last week. She made them last year and brought them to work, they were a big hit and I can see why. Unfortunately, last year Meeshie’s school instituted a new policy with regard to snacks-they don’t allow any of them. So, although in the past I’ve made some really cute teats: ghosts from the oreo truffles, pumpkins from small blocks of cheese, and witches hats with fudge stripe cookies and kisses, I was hesitant to make these. But then I remembered the party with the Girl Scouts! Thanks Carol! These were a big hit with the girls and us! Beat the butter, sugar, egg, and extracts together. In another bowl, combine the flour, baking powder, and salt. Slowly add the flour mixture to the butter mixture. Add the green food coloring until you achieve the desired color. (You can skip this step if you want them to look more mummy-like.) Divide the dough in half, wrap in plastic and refrigerate for 30 minutes. Take out one half of the dough at a time and break off a small amount of dough. Roll out between your fingers to create the knuckle shape. Place on a parchment paper lined cookie sheet (or grease the pan). Use a butter knife to make indents in several places to resemble the wrinkles in a finger. Bake in a 325 degree oven for 20-25 minutes. Let cool. Once cooled, squeeze the red or black decorating gel onto the tip of each finger and gently press an almond on top so the gel oozes out from underneath. 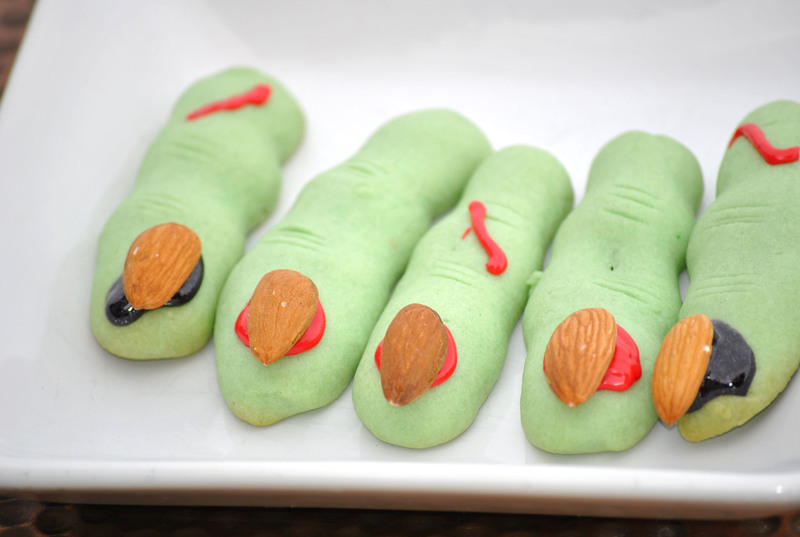 I also used some red gel to give some of the fingers a cut, just be creative! In the month of May, Meeshie’s school celebrates summer birthdays. So, this past Monday we brought in her birthday treat. Do you know what you want me to make? I’m not sure but I’m kinda cake popped out. Great. I was actually prepared to make some tie-died cake pops, too. So between the two of us, she decided on some chocolate cookies with marshmallow in the center. These cookies taste like brownie bites and are totally worth the little extra work. The marshmallow must be kept in the freezer so it won’t get tacky while you assemble the cookie. As a matter of fact, while I was waiting for the oven, I stuck the assembled cookie in the freezer for good measure. 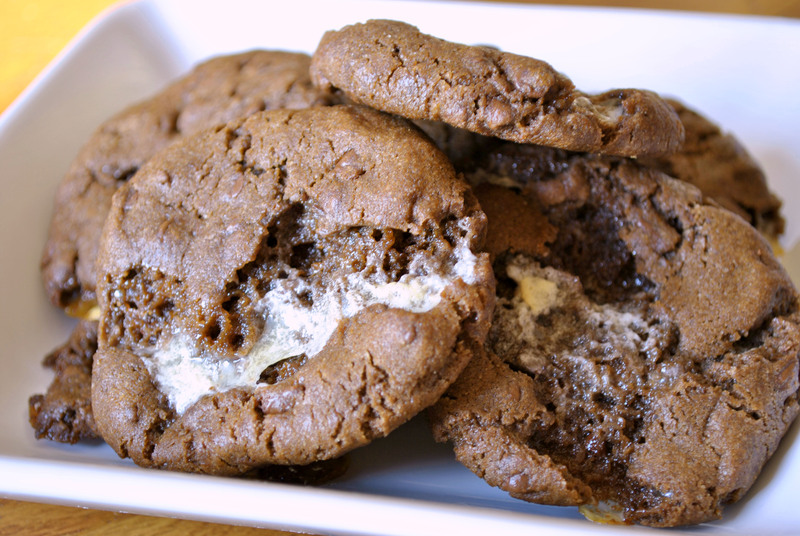 Most of the marshmallow melts inside of the cookie and gives it that brownie consistency. Preheat the oven to 400 degrees. Keep the marshmallows in the freezer until you are ready to assemble. In a medium bowl combine the flour, cocoa and baking soda. Set aside. Combine the sugars in a large bowl. Add the butter to the sugars and blend. Add the eggs and vanilla and beat until light and fluffy. Add the flour mixture to the sugar mixture. Add the chocolate chips blending until combined. The dough will be very stiff. Gather 4-5 frozen marshmallows in the palm of your hand and cover them with heaping spoonful of dough. 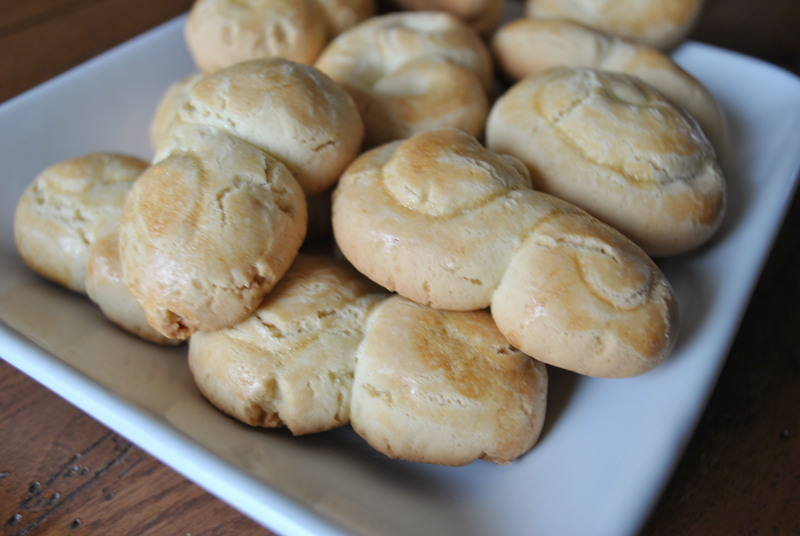 Wrap the dough around the marshmallows, completely encasing them and form in a 2 inch diameter dough ball. I actually take the dough and flatten it in my palm, place the marshmallow inside and then close the dough. Place the balls on an ungreased cookie sheet, 2 inches apart. Bake for 8-10 minutes. Cool on the pan for at least 2 minutes before transferring to a cooking rack. And yes I know that it is unusual that Meeshie’s school still allows homemade treats. Not many do. I’m actually not sure about the policy at her school myself. I just always bring in treats for the office too and they’ve never said no. She has only one more year at this school and I’m really going to miss the office staff. Those ladies are so sweet. 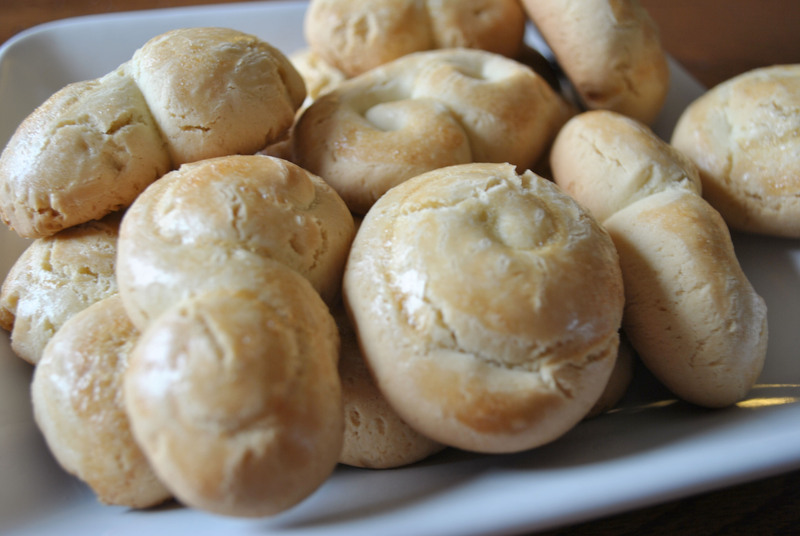 When I wrote about the sweet table last week, I promised that I would post this crescent recipe. I have been making this recipe forever. 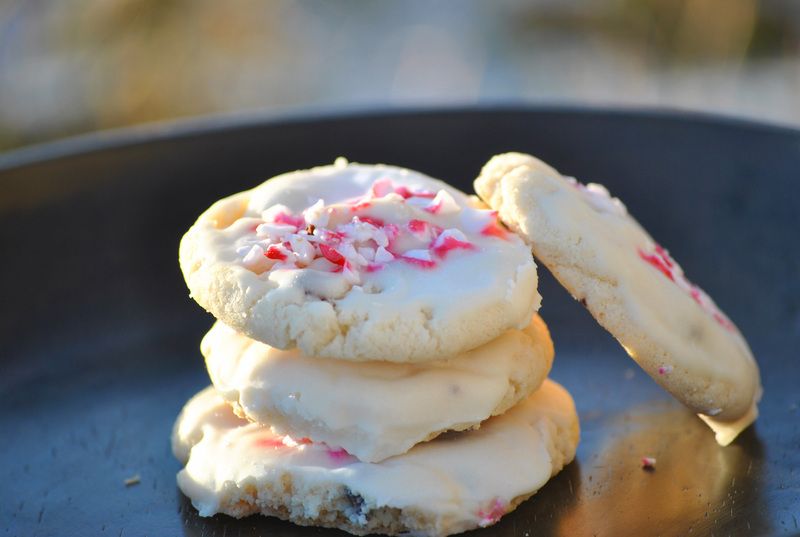 It has always been a family favorite and it is definitely on my Christmas cookie list. Meeshie loves making the ropes that are formed into a crescent shape. Double this recipe, you won’t regret it! Cream the butter and sugar together. Add the water and vanilla. Mix well. Add the flour and pecans, form into a ball and chill for three to four hours. Preheat the oven to 325 degrees. Pinch off about a golf-ball-sized ball and roll it into a snake. Shape into a crescent. Bake for 20 minutes. 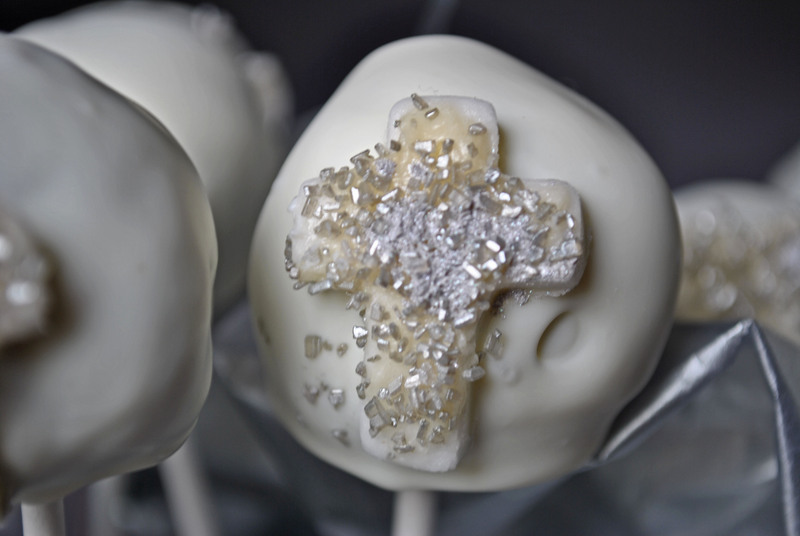 Cool slightly and sprinkle with powdered sugar. These cookies are very fragile so are best stored in a large flat container. Now that I can finally sit back and think about the communion party I want to talk about the sweet table. I decided that since I was going to use a caterer for the party I wasn’t going to bother with too many appetizers and instead concentrate on a sweet table. Besides the invitations stated that luncheon would be served at 2:30 p.m. and I figured that if you didn’t go to the church you would show up in time for the luncheon. Plus I love a sweet table. I of course had a cake and then I had various goodies. 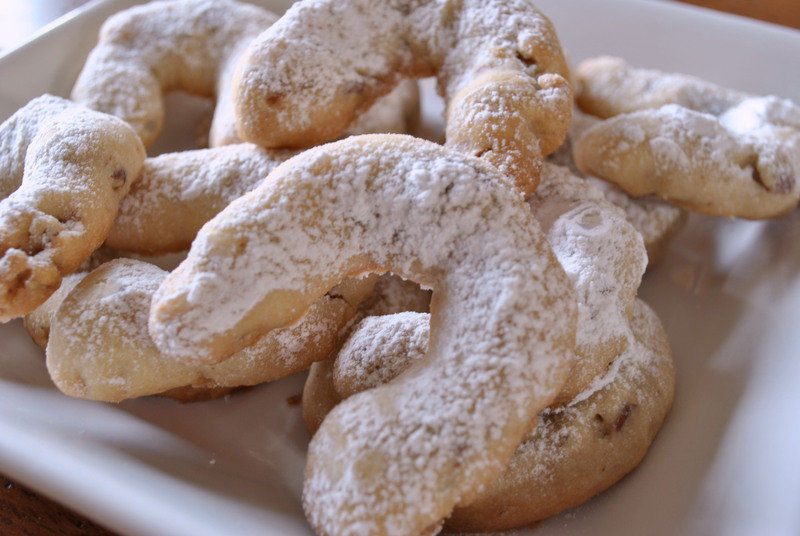 Limoncino cookies. These were so fantastic. It was a light lemon cookie with a glaze made with lemoncello. I was fortunate enough to have gotten some homemade lemoncello. Homemade from Italy. I’m waiting to get the recipe and can’t wait to make it myself. But that’s another post. Kolaczky. I made these that morning. You have to have kolaczky when they are fresh. I think there is some kind of rule somewhere about that. I made 8 dozen of these puppies. I had less than a dozen left once all the smoke cleared. And I wasn’t able to make any raspberry ones because they didn’t have that flavor at the store. I made cherry ones instead. They went. They were good. But I prefer the raspberry. It was heavenly. I love a good sweet table with wonderful bakery, especially cookies. I’ll be posting soon about the crescent recipe! But I may post about some scones a good friend suggested I make first. 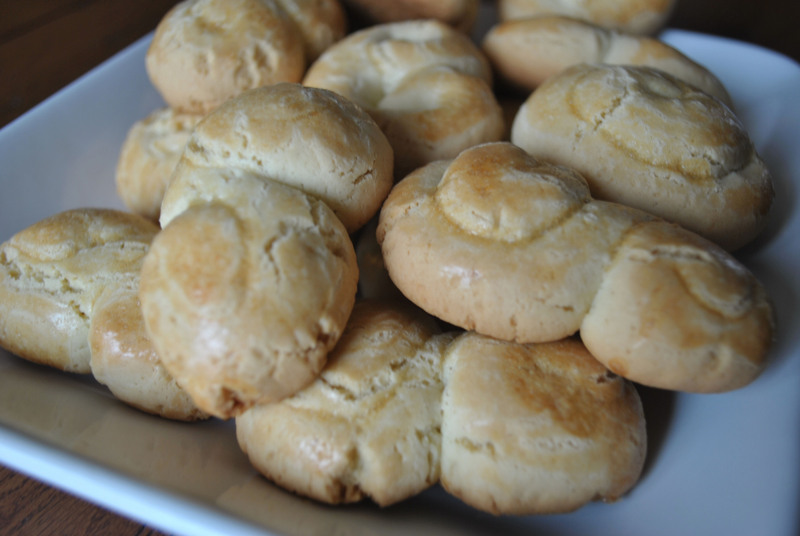 My girlfriend came over this weekend and we made some traditional Greek Easter cookies. This year Greek Orthodox Easter and Christian Easter are on the same day. 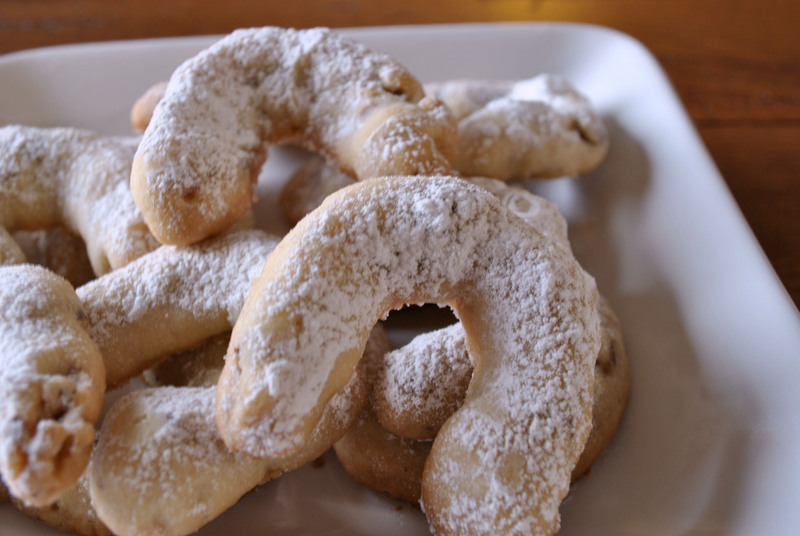 We made a cookie called KOULOURIA. They are crisp cookie, almost like a butter cookie. When she sent me the recipe we went through the ingredients. Since she was coming over to my house to make them we both wanted to be sure of what ingredients were on hand and which we needed to purchase. Beat the butter, egg yolks and sugar until light in color. Warm the milk and the ammonia and baking soda to the milk. Add the milk mixture to the butter mixture. Mix well. Add the vanilla. Add the box of cake flour. Knead well. Add the 2-3 cups of flour as needed. 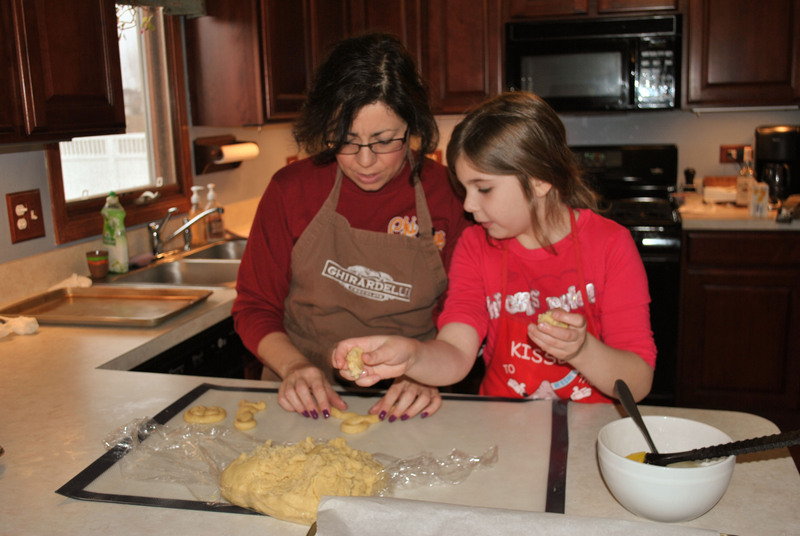 The dough should be soft and not stick to your hands. Refrigerate for 2-3 hours. 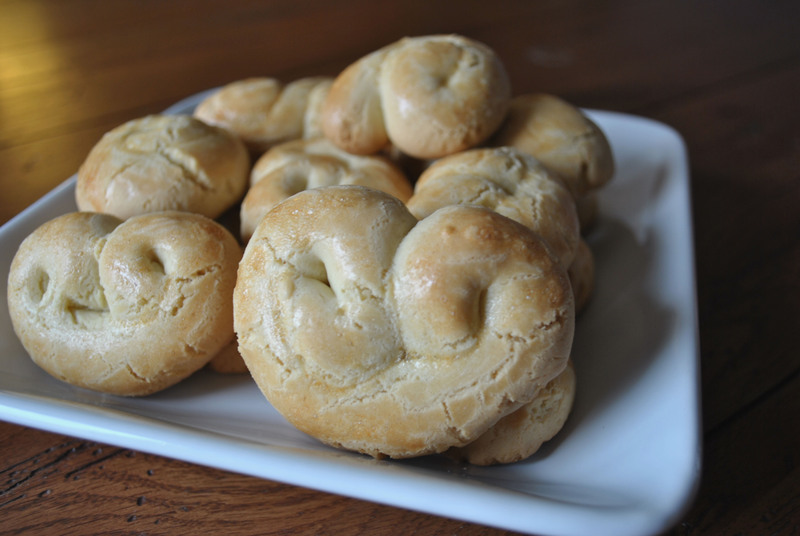 Roll out the dough and make into shapes such as ‘s’, knots, and coils. Brush with the beaten egg for color. Bake in a 350 degree oven for 20 minutes until golden brown. Makes about 80 cookies. Please note that I told my friend that I had ammonia as well as the cake flour. She laughed and told me that the ammonia was actually a powder. I googled it. It is similar to baking powder but it does smell like liquid ammonia. Meeshie was more than helpful. She made the coil shapes and some knots. She even made some cookies that were ‘k’s and ‘c’s. 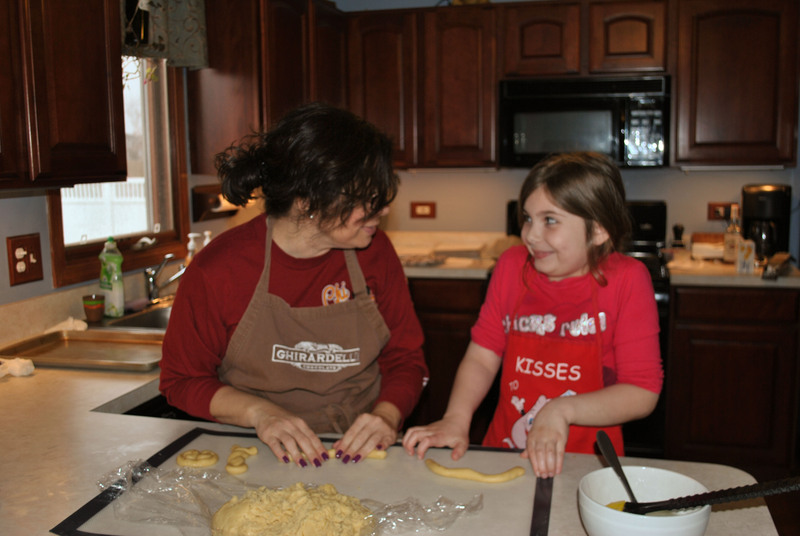 Here is a picture of the two ladies working hard on the Koulouria. We had a good time. 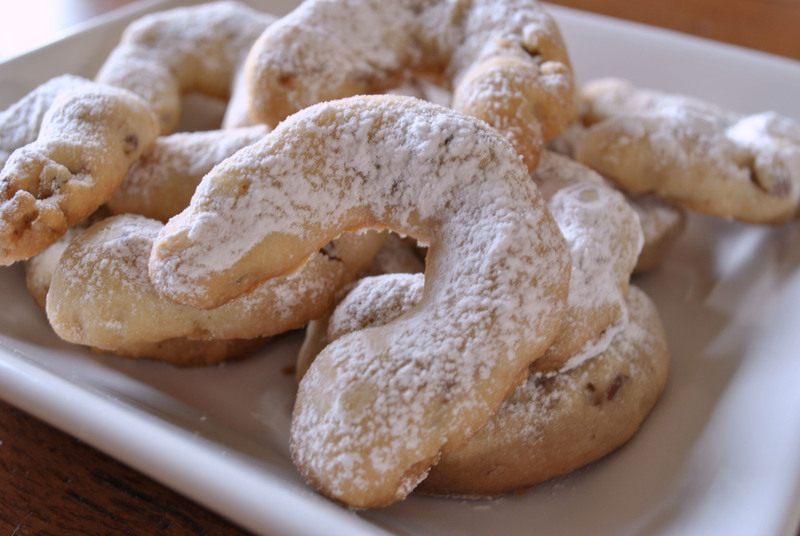 I’m looking forward to getting together later in the year to make Greek Christmas cookies.